BALI, Dec 4 2013 (IPS) - The World Trade Organisation’s ninth ministerial meeting at Bali, Indonesia has morphed into a fierce battle between the countries seeking social safety nets for hundreds of millions of poor people and those insisting on having advanced import-facilitation programmes in the developing countries on par with the industrialised nations. These two narratives openly clashed at the plenary meeting Tuesday. “Millions of people depend on food security and millions of people are going to see what will be done on this vital issue,” Kenya’s foreign minister Amina Mohamed told IPS. “In Africa there are millions of people who need food security and they are all waiting to see if the ministers in Bali are going to be sensitive as an international community to the livelihood and survival concerns of the most vulnerable people,” she said. India’s trade minister Anand Sharma said at the plenary meeting that “Food security is essential for four billion people and is an important goal of the millennium development goals. “Food security is non-negotiable,” said Sharma, maintaining that India cannot accept the current interim mechanism because it fails to provide legal certainty. Public stockholding of food grains to ensure food security must be respected, he said. In the run-up to the Dec. 3-6 Bali meeting, India along with a group of countries including Bolivia, Cuba, Kenya, South Africa, Venezuela and Zimbabwe pressed hard for improved rules to ensure that their public stockholding programmes for food security are not undermined by flawed trade rules. More importantly, “any trade agreement must be in harmony with our shared commitment to eliminate hunger and ensure the right to food, which we accepted as part of the MDG agenda,” the Indian minister said. At issue is whether developing countries like India and Kenya, which have massive public stockholding programmes, particularly procuring food grains from small and poor farmers at minimum support prices, should face legal challenges due to rules that are inconsistent with current global economic realities. Over the last 15 years, prices of essential food items have gone up by over 250 percent. India, along with the members of the G33 coalition of 46 developing countries led by Indonesia, made a strong case for changing some parameters in the current WTO agreement on agriculture. The G33 called for updating the external reference price in the WTO agreement to reflect current global prices. The coalition also demanded that excessive inflation be taken into consideration when assessing the commitments. The industrialised countries, led by the U.S. and EU, vehemently opposed the G33 demand last year, saying they would never allow any change in the rules. But after sustained sabre rattling and intimidating threats, the developed countries backed down from their initial position, promising a more flexible response. They offered what is called a “Peace Clause” as part of the Bali package, which would provide temporary respite – for no more than four years – from any trade disputes. But although they agreed to continue the discussion, they did not commit to finding a permanent solution. In sharp contrast to their opposition to food security proposals from the developing countries led by India and Kenya, the industrialised countries pressed for a brand-new agreement on trade facilitation, which involves comprehensive changes in the customs and import procedures. The new TF agreement calls for a number of changes in the previous WTO rules. If concluded at Bali, the trade facilitation agreement would save around 441 billion dollars for developing countries, said the EU trade commissioner Karel de Gucht. In fact, the International Chamber of Commerce claimed that a WTO trade facilitation agreement would provide gains to the tune of one trillion dollars for the developing and least developed countries. WTO director general Roberto Azevêdo has also made similar claims over the last three days to drum up support for the Bali package. Although the industrialised countries have constantly repeated the mantra that trade facilitation would deliver enormous gains, they have so far offered no conclusive evidence to that end. “Unfortunately, these figures depend on too many unjustifiable assumptions to be relied on,” wrote Jeronim Capaldo, an academic at the Global Development and Environment Institute at Tufts University near Boston in the U.S. Inaccurate estimates and unclear gains have become the order of the day. “It is hard to see how uncertain gains and unequal distribution of costs [underlying trade facilitation estimates] can justify diverting resources to trade facilitation from badly needed policies such as the strengthening of social safety nets,” Capaldo argued. 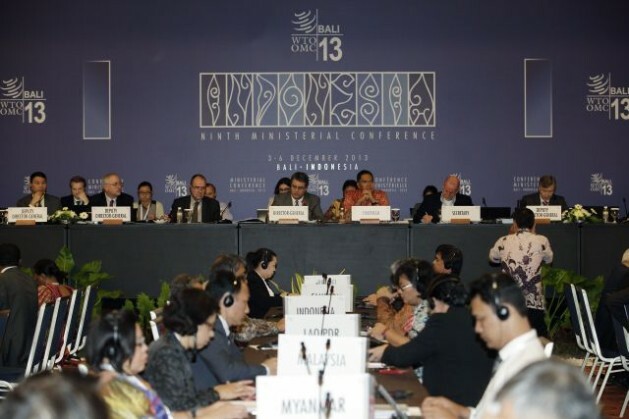 The Bali meeting has brought the simmering conflict into the open. Participants described it as a clash of these two narratives – a food security-plus approach as proposed by India and other developing countries versus a TF-plus approach pushed by industrialised nations and some developing countries. South Africa’s trade minister Rob Davies cautioned against the imbalances in the Bali package, particularly the tilt towards trade facilitation. The fate of the Bali package now hangs in the balance. In the next 72 hours, the world will know whether a solution could be found for addressing the food security issue – or whether the Bali package will be torpedoed due to unbridgeable differences.